The Irish Terrier is a dog breed from Ireland, whose origin is not known. The Irish Terrier, one of many breeds of Terrier, is believed to have descended from the rough haired Fox Terrier. Its selection began only in 1870. The Irish Terrier Club was founded in 1879 and the breed was displayed for the first time in Glasgow in 1920. The Irish Terrier is intelligent and a specialist in hunting rabbits and otters due to its very good sense of smell. 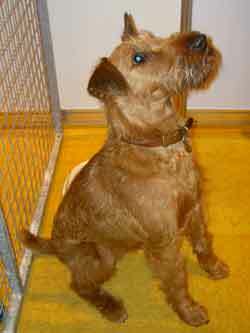 Irish Terriers are coloured golden red, red wheaten, or wheaten. The dogs can become large and grow up to 45 cm with a weight of 10 kg.